Did you see that? Of course, how could you miss it? Characterised by its vivid stripes and zany patterns, zebra wood is impossible to ignore, and a zebra wood dining table from Mac&Wood is guaranteed to take the centre stage in your home. With its bright, unforgettable pattern, it can transform the humblest dinner into a dazzling event, a fabulous memory, a carnival of colour. If your dining room is begging for a dramatic statement piece, this is the table for you. Zebra wood is not for the faint of heart. It’s for daring personalities in love with colour and pattern. It’s for artisans looking for brazen streaks of blacks and browns set against an illuminating pale-yellow background. The unrefined texture and rich colour of this heavy hardwood defies imitation. Sourced from equatorial West Africa, this gorgeous wood is felled by hand and carefully carried off the mountain slopes to be cut, shaped and crafted into our sublime tables. Creating exquisite furniture from extraordinary materials is our vocation. Because an exotic material like zebra wood is so rare and can be difficult to work with, we use cutting-edge technology to ensure that it is treated with the utmost care. Apart from its fascinating aesthetic, the dedication that goes into handling our wood means that your zebra wood dining table will arrive in pristine condition. We work closely with you, taking time the to understand your bespoke requirements for your zebra wood dining table, and ensuring that the final product reflects your style and personality. 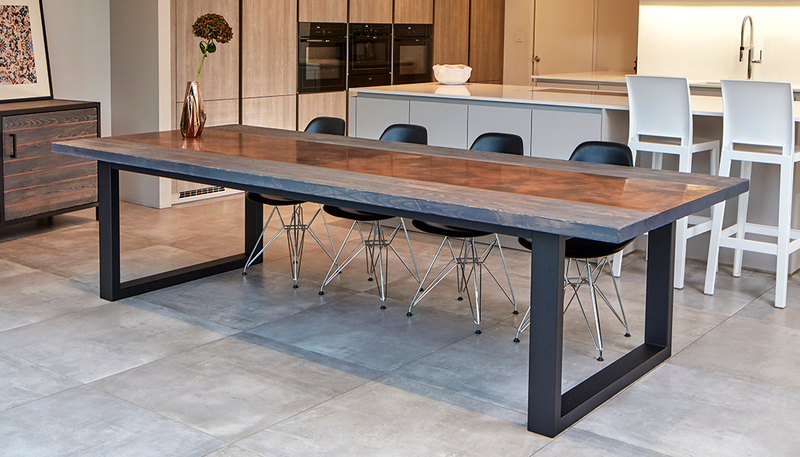 We firmly believe that a dining table should be so much more than a mere functional object. These tables are the heart and soul of every home, where you gather your friends, relatives and loved ones and share food, stories and time together. Don’t let these memories fade. Make sure they’re set against the bold backdrop of a zebra wood dining table from Mac&Wood.